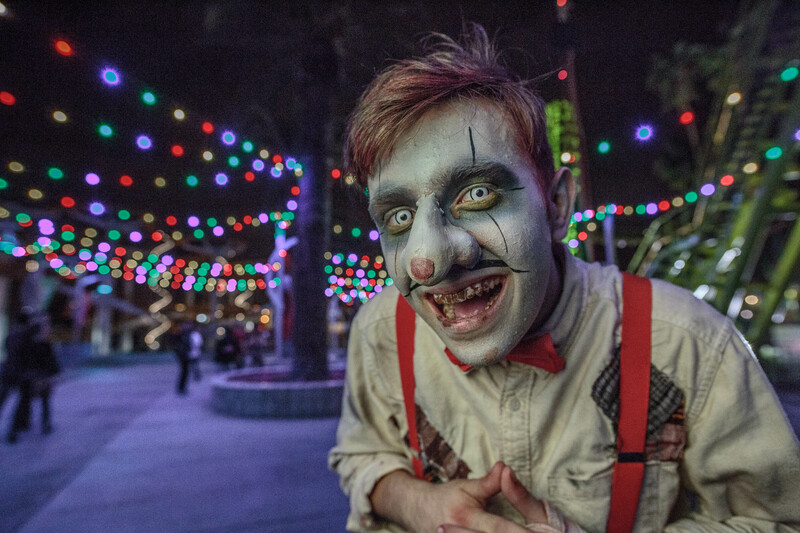 A Ghoul-Tide Tradition Returns: Knott’s ‘Scary’ Farm’s “Halloween Haunt 2018” Delivers The Shivers And Raises The Spirit Of Fright And Fun In So Cal! It’s always important to bear in mind that events of this nature always succeed best when giving us the opportunity to live out our most secret or heart-stopping fears (—no matter how unlikely they are–) and cast them in an exciting, fun and safer light. In this regard “Knott’s Scary Farm–the 2018 edition” Excels on all counts! Halloween in So Cal began a bit earlier than perhaps other parts of the country this season—as “Knotts Berry Farm” in Buena Park California, began welcoming eager (and unwary) guests to their “Nightmare” of thrilling, chilling, fun, fright, and festivities, with their annual re-imagining and transformation of the landmark amusement park into “Knott’s Scary Farm”! 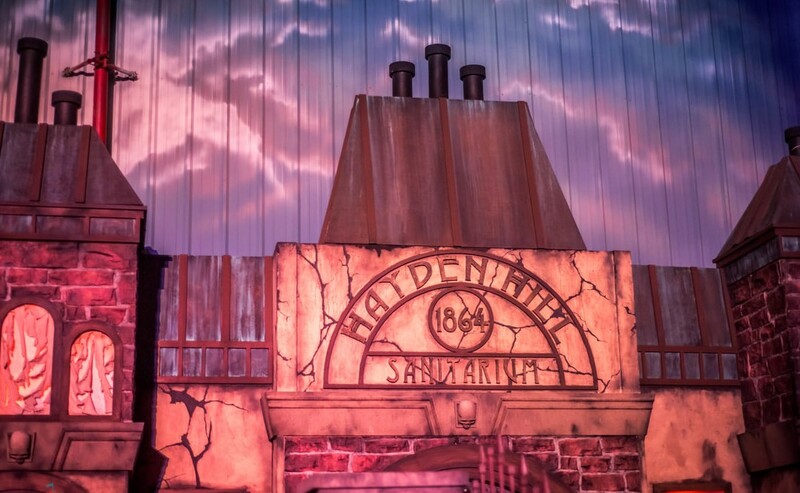 Returning for its monumental 46th season, once again Knott’s–one of the oldest continuous running theme-parks in the country, brings terror to vibrant, if startling, life in one of the largest immersive Halloween experiences in Southern California (—and not only that: it’s also one of the very first annual events of its kind in the entire country!) In fact, the whole ‘season of scares’ officially began on Thursday, September 20th , 2018 to be exact, when every inch of their various themed ‘sections’ began “breaking out” with heaps of hidden horrors, prowling creatures, spine-chilling scares, and new, terrifying twists! Past or Present though, it’s always important to bear in mind that events of this nature always succeed best when giving us the opportunity to live out our most secret or heart-stopping fears (—no matter how unlikely they are–) and cast them in an exciting, fun and safer light. In this regard “Knott’s Scary Farm–the 2018 edition” excels on all counts! With so much frightening fun to be had, NO WONDER they’re all smiles! Initially conceived in 1973 as a personal appearance by local Horror-show host, “Sinister Seymour” in the park’s then-recently opened “John Wayne Theater” (since renamed “The Charles M. Schultz Theater” in what is now known most of the year as “The Roaring Twenties-themed area,) since then, what’s become a long-standing seasonal So-Cal tradition has seen this local landmark dimming the lights and turning up the frights every weekend in October, thrillingly transmogrifying their ‘theme-park’ into a ‘scream park’—not to mention one of the biggest annual Halloween celebrations in the West—if not the world! Along the way, Knott’s “Halloween Haunt” essentially ‘grew up’ over the ensuing years, —and soon began being known far and wide as “Knott’s Scary Farm”, shifting the focus from younger children more to teenagers and young adults. This was also reflected in the featured “Guest Headliners” after “Seymour’s” death in 1975. The next to take over the “Star’ spot was the famed D.J. “Wolf Man Jack”, who was then followed by fellow radio giant, “Dr. Demento”. In the early 1980’s “The Mistress Of The Dark” herself, “Elvira” dazzled audiences— returning every season for over twenty years, before stepping down in 2017. “Hacks” the great new comedy show in “The Charles M. Schultz Theater” dares to ask: “Why do all the best Actors wind up in the ‘Cutting Room’ ?! “Fiesta Village” also ‘raises the spirit’ of “Dia De Los Muertos” with a jammin,’ slammin’ Dance Party, “Awaken The Dead”! 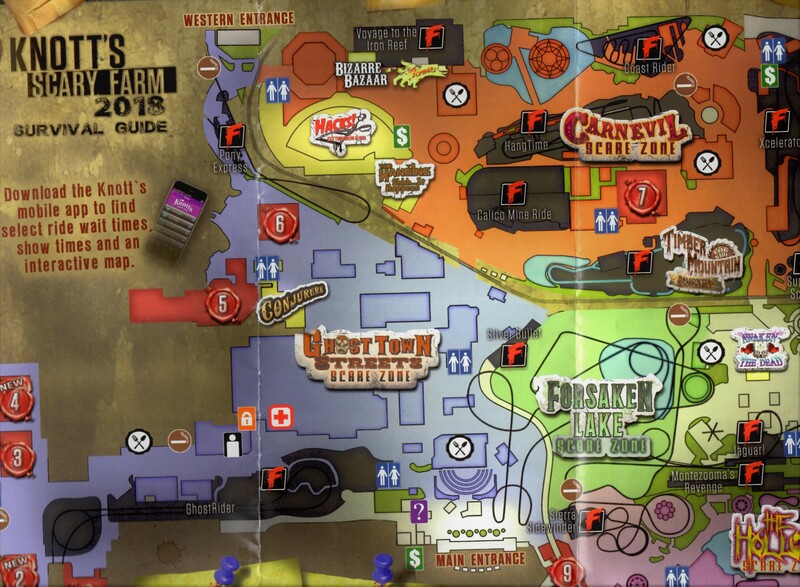 For maximum enjoyment—and minimum wait time, the additional purchase of a “Fast Fright Pass” is most emphatically worth the investment, allowing attendees to “ride and scream” all night long with unlimited priority access to all the mazes plus priority boarding on all “Fast Lane” rides (which are most of them!) Although separate from the admission price and with the cost varying by night, a special “Fright & Fast Lane Combo” package which includes admission, is also available exclusively on-line (and Knott’s Season Pass-holders can save an additional $5.00 on the purchase price.) After all there’s so much to see, do, and be thoroughly astonished (or unhinged) by. This time around attendees will come face-to-face with fear as they hazard through 14 haunted attractions–including mazes, all, divided into a collection of Phantasm-filled areas known as “Scare-Zones, with each one eager to welcome—often with gaping jaws–new and unsuspecting victims…er, ‘Guests’. Chief among them are “Ghost Town Streets” (including “Fog Alley”) in which the various lanes and byways are cast into near-darkness, broken only by a dense fog. Gathering here are the weirdest of the weird and most blood-curdling characters congregate to ‘cross your path’—often literally ‘throwing themselves at your feet’ to do it. This area also serves as the ‘gate way’ to several mazes that lie just beyond the “Ghost Rider” wooden-rollercoaster’s farthest, final exit. Directly across from this, lies “The Hollow” (as in “Sleepy Hollow”—a place to really lose your head over!) One of the new ‘zones’ for 2018, within this murky, desolate realm we’re warned, the fabled “Headless Horseman” and his army of the undead lie in wait–primed to unleash their malevolence on any heedless guest who dares enter. Returning favorite “Paranormal Inc.” proves without a doubt that Live Remote Broadcasts can really be “Hell” once things get going! 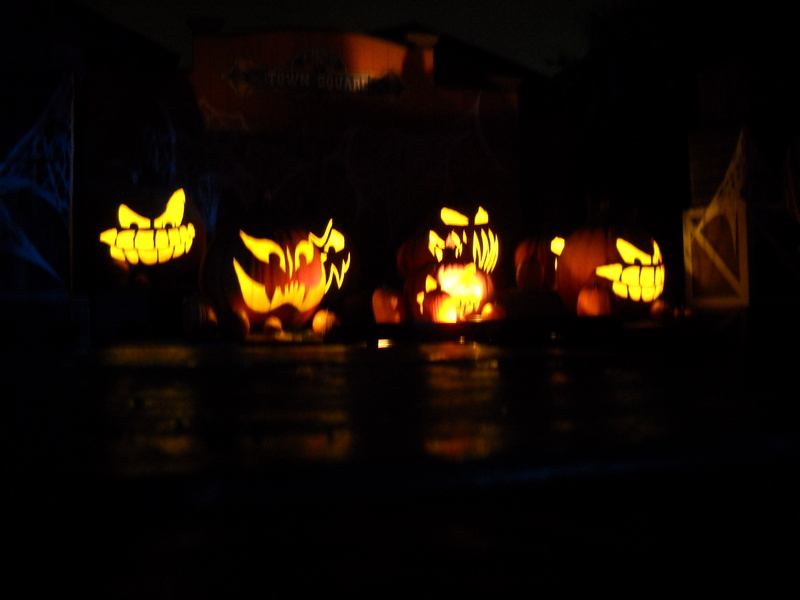 All the while stacks of ghastly-grinning “Jack O’Lanterns” and “Scarecrows”-ethereal and cadaverous, gaze mutely on. Also returning to Knott’s “Boardwalk” area is “Carn-Evil”—transforming it to a place where “the freak show is the main-event and countless crazed and menacing clowns walk amongst you” (—each craving your ‘undying’ attention!) Not co-incidentally, this is also where some of the most thrilling roller-coasters are, including the recently unveiled “Hangtime’ (which itself is most definitely NOT for the faint of heart!) Just beyond it situated in and around the waters underneath the “Silver Bullet” rollercoaster, new this year too, is “Forsaken Lake”, arguably the most down-right creepiest of all the ‘scare-zones’. Evoking an overtly Victorian-era style of jolts and jitters (over and above the horde of sepulchral monstrosities it’s patently seething with,) this locale is otherworldly and more than just a bit disquieting even to walk through. Unleashing its band of gothic fiends, which have been ravaged by the dark and murky waters, they wander through their flooded-out crypts and half-submerged tombstones–looking for victims to drag back into their disturbed–and very watery graves. Twice nightly (at 8:45 pm and 11:45 pm) an eerie ‘funeral procession’ takes place featuring a group of black crepe and faded lace attired ‘mourners’ looking like a road-company version of “Sweeney Todd”. 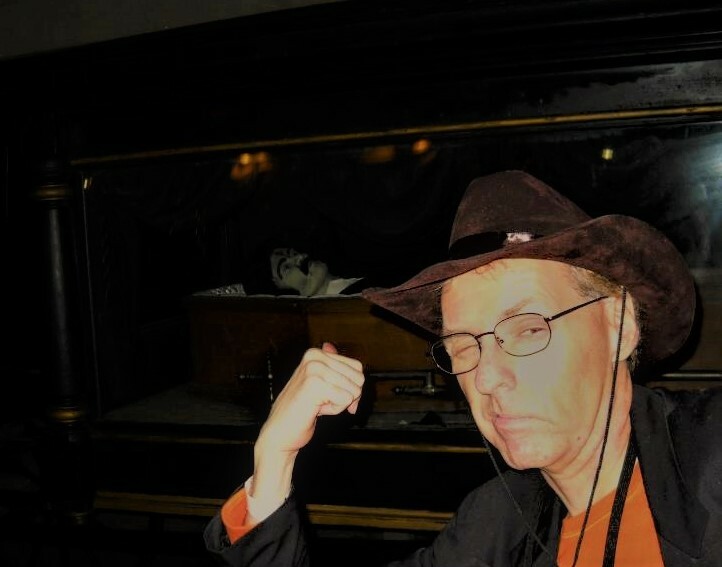 Solemnly–even reverentially they carry a rough-hewn casket to the base of an equally foreboding marble crypt, as all the while a dirge-like rendition of ‘The Hearse Song” (better known on these shores as “The Worms Crawl In, The Worm’s Crawl Out”,) is played in the background. Once they arrive, the crypt doors burst open revealing a genuinely macabre twist that’s guaranteed to set the hairs on the back of your neck firmly at attention. Sorry folks, this one is far too priceless to give away here—you just have to be there and absorb it all for yourself (—just don’t say you weren’t warned!) 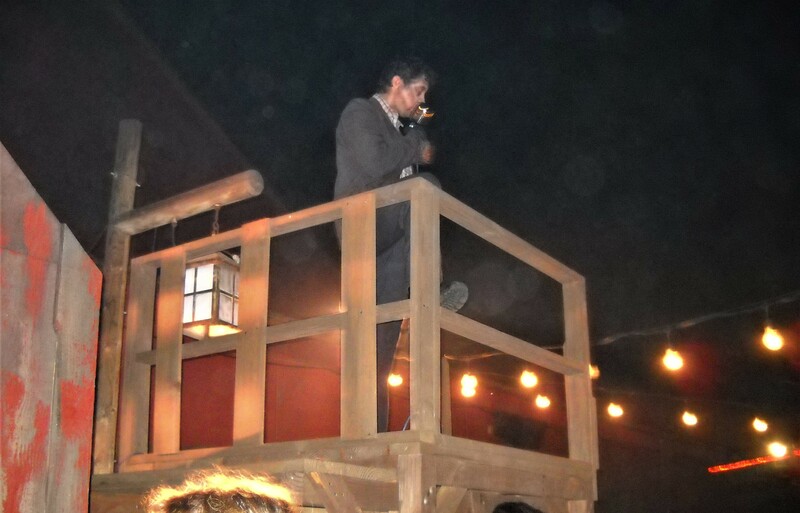 This too, is a throw-back to all the engrossing bits of ‘street theatre” of which “The Hanging” is successor to, dating back to the event’s formative days in the 1970’s, then being called “The Midnight Hanging Of The Witches”, and ‘executed’ at a gallows specifically constructed in the midst of “Calico Square”. Since then, “The Hanging” has grown into a more formally-staged comedic affair—not centering on “witches”, “sorcerers” or any one of a “supernatural” bent and instead, setting their sights on assorted Pop Culture icons who may be good and ready for a figurative skewing. Of course, as anyone who’s ever attended will tell you, it’s the mazes that authentically shock and a-maze, making this event positively one-of-a-kind. Little wonder too, that–as with many seasonal innovations of this nature, “Knott’s” was also pioneered new ground by creating these little microcosms of mayhem, and this year is certainly no exception–numbering nine in all (two being debuted for 2018.) Situated in what the rest of the year is “The Cloud Nine Ballroom”, in this instance is now an old forgotten fun house or long abandoned attraction, aptly named “Dark Ride”. From the looks of things though, any actually mobile “ride” element however, has long been removed (although the supposed track of an erstwhile “ride” is what entrants into this forlorn and supremely sinister attraction use to ‘lead’ them through it until the end (–just hopefully not theirs!) 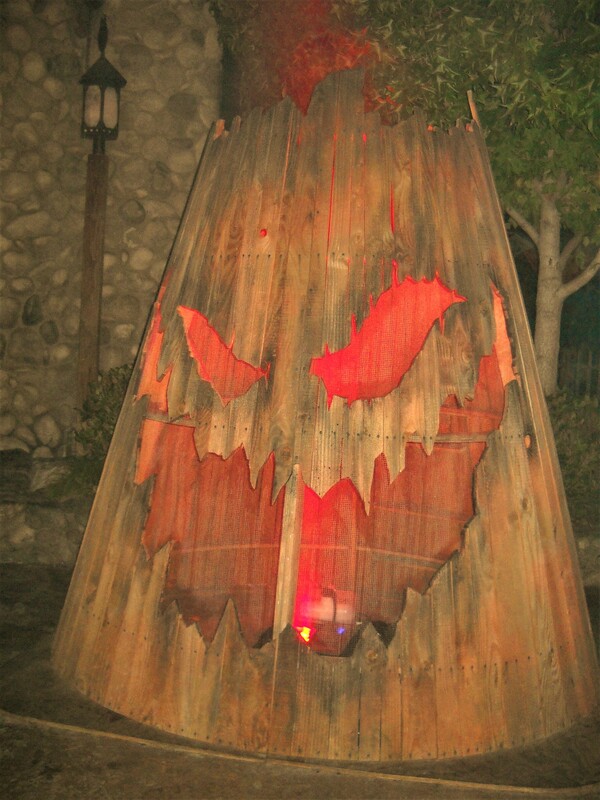 Moreover, perched in the shadow of the oppressively looming “Ghost Rider” is “Trick Or Treat: Lights Out”. This too, is one of the Best mazes in this or any year, and the expositional narrative behind it could very well make for an engrossing Horror Movie in its own right! The one time that you might want to forgo the “Fast Pass” and resolutely stay in line, involves “The Red Barn”–because much of the suspenseful ‘build-up’ occurs while in that line. Ironically (or maybe that should be “Portentously”) the queue begins at Ghost Town’s “Boot Hill Diggins” (a.k.a. the town grave yard,) leading you on a winding path of doom to the “Barn” in question, where outside a hideously ‘scarred’ “Preacher” beckons you to “The Church Of The Chainsaw”: “Brothers and Sisters come one, come all—short or tall, we want you all!” He proclaims; “Just be sure you bring an open heart and mind” (–if not, they’ll sure ‘open them’ for you—and while you’re still conscious enough to feel it!) Still another engrossing “back story” (one of the key requirements for a categorically successful Maze concept,) has been given to “Shadow Lands”. Arguably the most exotic of this year’s offerings, “Shadow Lands” invites valiant wanderers to fight off demon Samurai’s whose souls are cursed to rot within the depths of Purgatory. Embarking on a quest whose ingress is a sacred shrine in an ancient Japanese temple, guests then find themselves in the midst of those self-same “Shadow Lands”, where tortured, sword-wielding ghouls lurk in their attempt to lure you away from the only route out. In the same vein, “Pumpkin Eater” takes a markedly darker look at the old “Peter, Peter Pumpkin Eater” nursery rhyme. When regarded from a distance, through the lens of childhood, it all seems innocent enough; but what if one looks at it from the perspective of “Peter’s” unfortunate wife? You know, the one he had and couldn’t ‘keep her’ so he put (READ: Imprisoned) her in a giant pumpkin shell—and that’s merely one facet of this totally mind-blowing escapade! It also ingeniously ‘connects’ this labyrinth’s subject matter to the greater “Hollows” realm wherein it’s situated, by way of the shared harvest-time gourd central to both the rhyme and Washington Irving’s more “Legendary” tale. Just as unforgettable is “Paranormal Inc.”—a spot-on take off of such “Ghost Hunting” shows like–well, “Ghost Hunters” or “Ghost Adventures”. This one places you as member of a live TV broadcast for which you’ve been called upon to assist the stars and crew of the popular weekly series “Paranormal Inc.” Boasting aspects that call to mind Rob Zombie’s preliminary ‘maze’ concept for what would eventually become his infamous big-screen (or better put “Big Scream”,) hit “House Of 1000 Corpses”, and with facets of time-displacement that are also reminiscent of “The Shining”, instead of a an old house or cursed hotel, everything here unfolds in an abandoned psychiatric hospital called “Hayden Hills Sanitarium”. , the action commences immediately Being welcomed by one of the show’s ‘hosts”, you’re advised of what’s happening and, like any ‘run-of-the-mill’ “investigation” they’ve performed, what you might expect. They’re scarcely done though, when a petrified co-host stationed further into the sanitarium appears on a TV monitor alerting us that this time, the goings-on are for REAL (and it’s too late to turn back!) That’s when you catch the wraithlike projection of a female ‘spectre” who warns you, “You’re ALL going to die”! In an instant she’s there ‘in the flesh’ soaring over your head and across the main hall (–and that’s just for starters!) There’s even a seriously unsettling shift in time toward the end of this one that leads you onto a direct encounter with the hospital’s demented Head-Nurse in her native decade (the 1940’s) back when she was enacting her unspeakable forms of ‘treatment’! Likewise, easily one of the very best mazes in the history of “The Haunt”, expect loads of projections and electrical ‘effects’ in play here too! Laser effects staggeringly simulate waist-high ‘water’ as slimy little denizen’s pop-up (and out) to welcome you to their soggy, submerged habitat. If that weren’t enough, as you attempt to take refuge aboard a sunken “Pirate Galleon” you find to your peril that it’s continuing to sink–while you’re on it. Meanwhile, with its entrance merely a stone’s throw away from both “The Depths” and “Trick Or Treat: Lights Out”, “Dark Entities” also transports travelers to a strange and surreal world—this one set on an imperiled space station where a mysterious alien virus has broken out, wreaking havoc upon the crew. Add to it that once you arrive, you, yourself are diagnosed to be kind of ‘Patient Zero’—in effect, ‘carrying’ this dreaded bio-hazard into the station (and those manning it.) the farther you venture in. Even the Iconic “Timber Mountain Log Ride” is all dressed up for a High-Spirited Holiday “Hootenanny”! Not to be overlooked either are the rides–many even more pulse-pounding this time of year than any other. 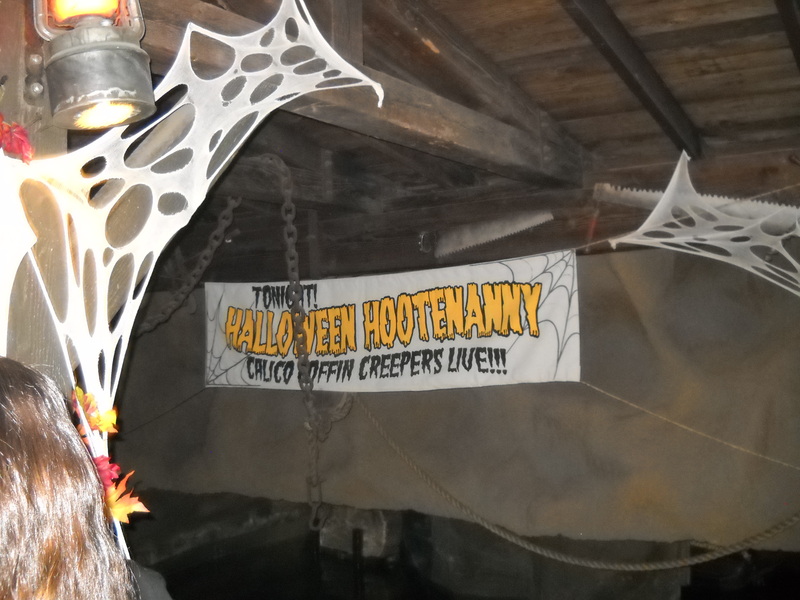 “The Timber Mountain Log Ride” has been transformed in the brightest, most festive way possible for a “Halloween Hootenanny” (Featuring the bluegrass anthems of “The Calico Coffin-Creepers” band!) Keep your eyes peeled and you may even glimpse a crashed UFO up there on the Mountain too! At the same time, the “Calico Mine Ride”—itself recently upgraded and improved after 50 years, on this particular occasion has remained curiously untouched (meaning not decorated up for the holiday.) Nonetheless, for many as yet unfamiliar with the new, fantastic look and feel (to say nothing of the incredible state-of-the-art “audio animatronic” figures now populating it,) just seeing all these improvements still made it worth visiting. This said though, here’s a note to those at “Cedar Fair”, the Corporate entity that now owns “Knott’s Berry Farm”: Being that “The Calico Mine Ride” is one of the few ‘inside’ attractions the park contains, makes it by default ‘Blue-Chip real-estate’ at an event like this and too good an opportunity to pass by; so PLEASE next year fire up those imaginations—we’d all love to see this one re-included in all the festivities! “The Nightmare Never Ends” (at least until “All Hallows Eve’n” 😉 until then, the night-time is the ‘fright time’ so stop on by for ‘a spell’ (on top of all the tricks, treats, and trepidation, the old’ park can dish out!) “Stirring” every Thursday through Sunday evening (–and of course, on Wednesday, October 31st, 2018, with an additional Wednesday evening on October 24th–) all the fun and fright kicks-off at 7:00 pm through 1:00 am on select Wednesdays, Thursdays, and Sundays, and 7:00 pm to 2:00 am Fridays and Saturdays. (Due to the explicit and intense nature of the event, this is not recommended for children under 13.) For more information on “Knott’s Scary Farm”–including admission, park hours, and other upcoming events, visit http://www.knottsscaryfarm.com –or download the official “Knott’s Berry Farm” app for your tablet or smart phone. Better yet, join the “scary” conversation by using the hashtag #ScaryFarm on Facebook, Twitter, Instagram and Snapchat, and while you’re at it, may your favorite plastic-pumpkin candy-bucket be filled with “Season’s Screaming’s”–and a “Happy New Fear” to all! Head out to “Knott’s Scary Farm’s” Annual “Halloween Haunt” Celebration–after all, you never know who you might ‘dig up’ there! 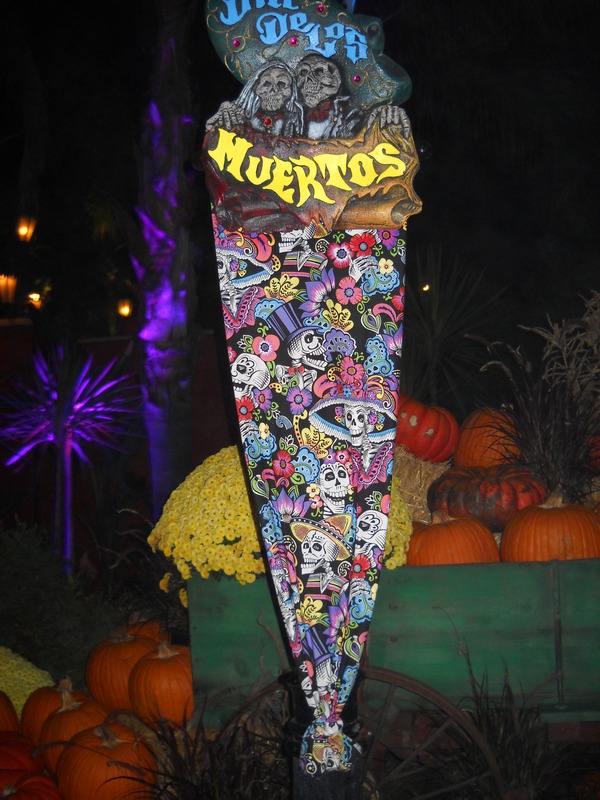 This entry was posted in Events and tagged Amusement Parks, Annual Events, Awaken The Dead, Buena Park CA, Calico Mine Ride, Calico Saloon, Camp Spooky, Carn-Evil, Cedar Fair, Coaster Parks, Dance Parties, Dark Ride, Dia De Los Muertos, Fast Fright Lane, Fiesta Village, Fog Alley, Forsaken Lake, Fright and Fast Lane Pass, Ghost Town, Ghost Town Streets, Hack: Cutting Room Floor, Halloween 2018, Halloween Haunt, Hang-time, Knott's Berry farm, Knott's Scary Farm, Paranormal Inc, Pere Peter Pumpkin Eater, Pumpkin Eater, Roller Coasters, Scare Zones, Shadowlands, Silent Scream, Silver Bullet, So Cal Events, Southern California Events, Special OPS Infected, Special Ticketed Events, The Birdcage Theater, The Depths, The Ghost Rider, The Green Witch, The Hanging, The Holllow, The Red Barn, Theme Parks, Timber Mountain Log Ride, Trick Or Treat: Lights Out. Bookmark the permalink.